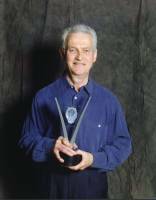 Local sound designer Larry Baker (My Dad) won ´Best Sound Editing in a Documentary Program or Series´ at the 2006 Leo Awards Celebration Awards Ceremony Friday, May 12, 2006 at the Westin Bayshore Vancouver BC. The Leo Awards are where the best and brightest film and television talent and programs in British Columbia are honoured for their work. Larry Baker of eCoustic Media Productions was honoured with 3 nominations for Leo Awards this year: ´Best Overall Sound in a Documentary Program or Series´, ´Best Overall Sound in a Youth or Children´s Program or Series´, and ´Best Sound Editing in a Documentary Program or Series´. A veteran of studio engineering for more than 40 years, Larry Baker has worked on productions for several Canadian and US networks. With credits on such well known series as ´SCTV´, ´Double Exposure´, ´Tom Jones´, ´Let´s Make A Deal´, and years on ´BCTV News´ including having a hand in writing the theme song used in the 80´s. His varied experience in location recording for film and video plus mixing and sound effects creation brings to each project those "extras" that produce top quality results. "It is wonderful to receive an award for doing something that you are so passionate about" said Larry on receiving the Award.He was a recipient of a Leo Award the first year the awards were held for ´Best Overall Sound´ for the series ´Cosmic Highway´ and has been nominated in subsequent years. This year´s award highlights Larry´s work on ´Shakin´ All Over´ a history of Canadian Rock´n´Roll produced by Soapbox Productions - the same company behind the recent Beachcombers Movies filmed on the Sunshine Coast. With over 800 entrants in this category, it is a prestigious acknowledgement of excellence in the field of Sound Design. Aired on CBC with very high ratings, ´Shakin´ All Over´ is soon to be followed by 2 more episodes that will continue to chronicle Canadian Rock´n´Roll. In addition, Larry will be working with Soapbox Productions on a documentary About the life of Long John Baldry. Moving to the Sunshine Coast in 2004, Larry has focused his energy on his new company eCoustic Media Productions. Based in Halfmoon Bay, eCoustic Media specializes in multimedia and video productions for small and medium sized business. The company is relatively new but has already produced videos for the Pender Harbour Coast Guard Auxiliary, Sechelt Marine Access Committee, Canadian Coast Guard Auxiliary, and has supplied stock footage to the BC Olympic Secretariat.